Since I originally wrote this commentary, energy markets have seen some significant changes. Prices and profits have soared. The President's national energy policy was enacted by Congress. Energy giant Enron collapsed. However, the myths of 2003 remain the myths of 2006. When evaluating President Bush's new energy policy, we must be careful to avoid the myths surrounding various forms of energy. Here are some of those myths. Myth: There is a shortage of petroleum. But higher prices are not always caused by shortages. Now that crude petroleum is at or above $70 per barrel, U.S. inventories of petrolium are at a six-year high — greater than when I originally wrote this commentary, greater than when the price was half of today's price. Shortages of a commodity cause higher prices. However, recent prices ($28.38 per barrel on 31 May 2001) are 18% lower than they were almost a year ago ($34.65 per barrel on 23 June 2000). Additionally, in a land supposedly so in need of more petroleum that we are preparing to despoil wildlife refuges, the Gulf coast of Florida, wilderness areas, and other fragile lands, we were actually exporting crude petroleum from Alaska to Japan in recent years. Myth: The price of gasoline is driven by the cost to produce it. 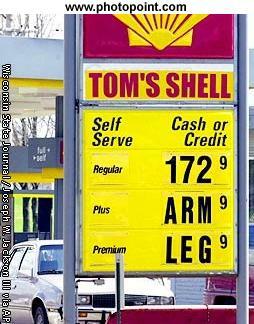 Less and less of the price of gasoline is now attributed to the price of petroleum. From February to March 2006, the "operating margin" portion of the wholesale cost of one gallon gasoline jumped from 49.4¢ to 66.2¢, a 34% increase. The operating margin excludes the cost of petroleum (at $70 a barrel, this is $2.22 per gallon), the overhead costs of refining, and all retail costs such as taxes and profits for the gas station. A large part of the operating margin is profits for the oil companies and compensation for their top executives. Yes, when the cost of crude petroleum goes up, the price of gasoline jumps almost immediately. But have you noticed that, when the cost of petroleum goes down, any reduction in the price of gasoline is delayed for weeks. Myth: Government mandates to reduce air pollution increase the price of gasoline. When California mandated the addition of MTBE to gasoline, the oil companies warned this would increase their costs. And the price of gasoline did indeed go up. But then, when we discovered how toxic MTBE is and California ordered the refiners to phase out its use, the oil companies again warned this would increase their costs. The "record high" profits for Exxon-Mobil that I cited in 2001 have been broken again and again. It costs more to put an additive into gasoline, and then it costs more to not put that same additive into gasoline? This clearly indicates that anti-pollution measures are merely an excuse for oil companies to increase their profits (for Exxon-Mobil, now at a record high). Myth: In California, an ignorant Legislature imposed deregulation of electricity, victimizing both the investor-owned utilities and their customers. When he signed the deregulation bill into law, then-Governor Pete Wilson and the leaders of the Legislature publicly acknowledged the role of the utilities in writing that bill. Actually, the utilities' lawyers and lobbyists may have had a greater hand in writing that law than did the staffs of the legislative committees that held the hearings. Then, in the November 1998 election, consumer groups succeeded in placing an initiative (Proposition 9) on the ballot to repeal the deregulation law. Pacific Gas and Electric (parent of now-bankrupt PG&E), Edison International (parent of Southern California Edison, which might follow PG&E into bankruptcy court), and San Diego Gas and Electric donated significant amounts of money to defeat this proposition. Also among those who contributed heavily to defeat the repeal of deregulation were six out-of-state utilities (some of which now sell electricity to California at prices inflated well beyond the cost of generating it) and three oil companies that supply fuel to electric generating plants. The proposition was defeated at the ballot box. We now know that the electricity disaster that befell California and other western states — and that resulted in the first recall of a California Governor — was engineered by the corporations that owned the generating plants and transmission lines, including ill-fated Enron. Further, we learned that the Federal Energy Regulatory Commission (FERC) is an agency of those corporations and not of the people's government. We learned this when FERC refused to force its "owners" to disgorge the profits they extorted from consumers or to repair the damage done to electricity retailers. Yes, the electric utilities and their friends fought in favor of the deregulation law. But why? They saw this law as an opportunity to escape from control by the California Public Utilities Commission. More important, they saw the opportunity to increase profits and make their executives very wealthy. Instead, pensioners who long believed that utility stocks were among the safest of investments have lost their retirement savings while residents and businesses now suffer rolling blackouts. The utilities brought this misfortune upon themselves. They wrote the law, and then they successfully defended it in an election. The utilities victimized their customers and their own stockholders. This was a self-inflicted injury. The Legislature was merely a willing servant that failed to exercise caution while enacting what the utilities wanted. Myth: California buy the generating plants and transmission lines? No! Everyone knows that government bureaucrats cannot run an enterprise. Having the government take over the electric utilities would make things worse, not better. We also know that Los Angles DWP played the same game as the for-profit generating and transmission corporations in gouging the rest of the state. Yes, government-owned utilities do operate in a very business-like manner. Municipal utilities — government owned — operate very efficiently. The Los Angeles Department of Water and Power (DWP) — bureaucrat operated — has no rolling blackouts, its retail rates are going down, it sells surplus electricity to investor-owned Southern California Edison, and it even makes an annual payment of surplus revenues (a "dividend payment") to the city of Los Angeles. If investor-owned electric utilities operated as does the DWP, California would not have the mess that exists today. Myth: Our dependence on imported oil is contrary to our national interest. We must reduce that dependence by developing and exploiting domestic petroleum reserves. This concept assumes that our great-grandchildren will never grow up, mature, and have great-grandchildren of their own. In the meantime, it is indeed in our national long-term interest to use foreign petroleum to the maximum extent that exporting nations will continue to accept U.S. dollars. In the end, their supplies will be exhausted. Then, we will still have the reserves that we need for lubricating products and petrochemicals. No, we cannot depend on the myth: "With modern technology, something will be discovered or invented to replace petroleum before we are in crisis." Technological advances do not happen overnight. The research should have begun already. But neither our government nor industry are funding such research. Note that, in the myth, the term our national interest actually means the fiscal interests of the oil companies. Their executives know the history of the U.S. government in leasing and selling mineral rights on federal lands and off-shore at bargain-basement prices. For short-term profits for themselves, they are willing to sacrifice the security of our descendants in order to obtain a low-cost source of petroleum that they can sell at substantially higher world prices. Myth: A national energy policy secretly delveloped by consulting with oil company executives would be good for our nation. The voters believed and re-elected Bush. What did we get? We got a tax-break for the oil companies that swelled their profits while the prices of petroleum and gasoline doubled. If you really believe this, then vote for Bush and Cheney in 2004. Myth: We can prevent blackouts such as happened in August 2003 if we had more deregulation of electric utilities along with higher electric rates. In the wake of the Great Blackout of 2003, officials in the Bush Administration suggested this would make utilities more attractive as investments and allow the companies to obtain more capital to use for upgrading the power grid. Get real! There is no profit for a company in improving the reliability of the grid, especially when other companies and municipally-owned utilities own part of the system. Less regulation and higher rates would only enrich the utility executives, who would find cutting corners and neglecting maintenance to be very rewarding. We need more regulation of electric utilities — not less — to force the companies to make unprofitable expenditures for upgrading and maintaining inter-company systems. And we need to make the utility owners — the stockholders — share in those costs and not place the entire burden on the customers. After all, the stockholders elected the executives who allowed the grid to reach its current unreliable state. * The more it changes, the more it is the same thing.